As if the existential threats to Europe weren’t sharp enough, the just-concluded Winter Olympics in Vancouver just hammered the point home. 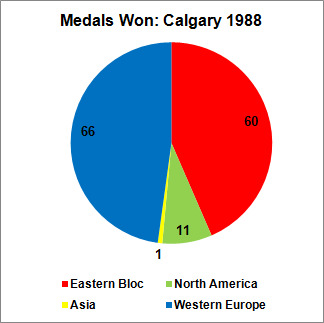 As Nate Silver points out, there’s been a dramatic swing away from Europe in terms of medal dominance from Europe (the old powerhouse) to the new dominate regions North America and Asia. 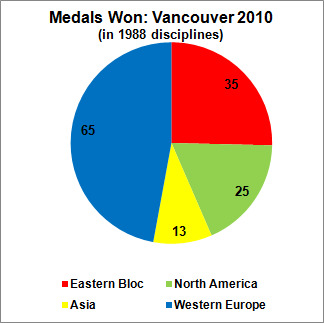 As you can see, European medal dominance is in decline, especially the dominance of the Eastern Bloc, though Western Europe has totally stalled. When you see certain markers like the Austrians failing to dominate Alpine skiing, or the Swiss failing to medal in bobsled, you’re seeing the symptoms of an ageing society without athletic depth among its youth.